Friday, September 20 is the last day you can register for the ATA Conference at the discounted early-bird rate. MOBILE "APPING." NEW THIS YEAR! Review the complete ATA Annual Conference Program now. But in addition to that, this year is particularly special for the Italian Language Division: we have more sessions than ever before, and two very special guest speakers: Italian best selling author Beppe Severgnini, and his English translator, Giles Watson. 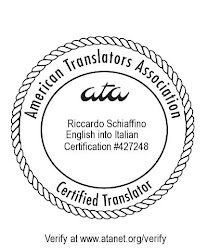 You can see more details about the Italian Language Divsion events in the ILD's new website. Just wondering why Severgnini needs an English translator. He once said (on "Italians", I think) how writing in English and translating were two different things, and that he preferred to leave the translation of his works in English to the person who cold do it better. I've seen a couple of Severgnini's books in English, and can confirm Giles Watson does an excellent job of conveying Beppe's humor and voice in English.